Enjoy the buzz of Dublin, Ireland’s vibrant capital. You will be based on the outskirts of Dublin in one of our recommended hotels. An oasis from the fast paced city, but still within close distance to the city centre. Whilst staying in Dublin you will have the opportunity to explore some of the city’s best attractions! Visit the newly opened Dublin Liberties Experience, located in a 300-year-old former mill and tannery. The Vintage Tea Tour bus is also a great way of touring around the city centre whilst listening to some 1950’s jazz (optional extra). Malahide, situated in the north of Dublin is home to the Malahide Castle & Gardens, formerly occupied by the Talbots – one of Ireland’s most famous families. This magnificent Castle dates back to the 12th century and is one of the oldest in Ireland. Howth fishing village, just over an hour’s drive from Malahide Castle offers beautiful views of Dublin Bay. You will also have the opportunity to explore a different type of Irish culture. This includes a visit to the Guinness Storehouse. Discover the interesting process that goes into producing the world-renowned beer. And you even get to enjoy a tipple at the end of your tour! To round your trip off we can recommend a traditional Irish night (extra cost). This includes food, music, dancing and also some audience participation! Pick and choose attractions from our bundle to tailor make your itinerary or treat yourselves to the whole bundle. Sail or fly to Dublin. Arrive in the city and check into your hotel for the next four nights. 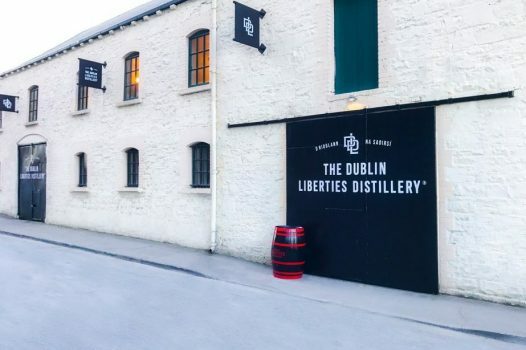 This morning we call into the new attraction, Dublin Liberties Distillery. Opened in 2018, this working Irish Whiskey Distillery combines traditional distillation with the latest technology. Guests will be guided through the full production process and the tour will obviously culminate in the Tasting Bar – the best part! – with some other opportunities to taste along the tour route! Your tour guide will entertain you with some wonderful stories on characters who lived over many years in the Liberties area of Dublin – the capital’s historic heartland. In the afternoon there is free time to explore this wonderful City. Alternatively, why not board the Vintage Tea Tour bus? Enjoy afternoon tea as the vintage bus takes you on a tour around Dublin City. After breakfast, travel north of Dublin to the pretty village of Malahide. Visit Malahide Castle & Gardens, the former home of the Talbots who were one of Ireland’s most prominent families and involved in some of the key moments and events in this country’s history. Take a stroll along the estuary or shop in one of the villages boutiques. Afterwards take the short journey to Howth fishing village. You feel a million miles away from the City as you stroll along the harbour, perhaps stopping for tasty fish and chips or local ice cream. Today visit Europe’s most popular attraction, The Guinness Storehouse. Learn everything you ever wanted to know about this world famous beer, then enjoy a complimentary pint of Guinness® while you take in the breathtaking 360-degree views across Dublin City. In the evening there is the option to enjoy a local Irish show with live music, Irish dancing, traditional Irish food and maybe some audience participation! After breakfast start your journey home either boarding the ferry from Dublin Port or flying home. The Hamlet Court Hotel is located in the village of Johnstownbridge and only 30 minutes from Dublin. It is a traditional 4 star family owned hotel with an excellent reputation. Each of the 30 en-suite guest rooms comes with television, telephone, hairdryer, tea & coffee making facilities, and free WiFi. The onsite pub gives you chance to have the craic with the locals and maybe listen to some live music. All rooms are ground floor. This lovely hotel is located only 4km from the picturesque seafront towns of Dun Laoghaire, Killiney and Dalkey, and is only a short drive from Dublin City and has easy access to the M50 motorway. There is also a Dublin bus stop located on-site. Guests can take advantage of the fantastic leisure facilities which include a deck pool and a fully equipped gym. All of the 90 spacious bedrooms have TVs, tea & coffee making facilities and complimentary Wifi. Coach parking is available at this hotel and there is a lift. All prices are per person sharing a double or twin room and with one free place, both are based on a minimum 25 full fare paying passengers. Prices do not include coach hire or travel insurance. Dates are subject to availability. Smaller groups can be quoted for on request. Pictures are for illustrative purposes only. Greatdays Holidays Limited has an ATOL licence (4279) and all of our air package tours are protected under this licence. In the unlikely event of our insolvency, the Civil Aviation Authority will ensure that you are not stranded abroad and will arrange to refund any monies you have paid to us for an advance booking. All the flights and flight-inclusive holidays on this tour are financially protected by the ATOL scheme. When you pay you will be supplied with an ATOL Certificate. Please ask for it and check to ensure that everything you booked (flights, hotels and other services) is listed on it. Please see our booking conditions for further information or for more information about financial protection and the ATOL Certificate go to: www.atol.org.uk/ATOLCertificate. Based on Exchange rate of £1 = €1.112 Correct as of January 19. We can arrange coach hire from your local area – please ask for details. Flights from the UK available – please ask for details.